It's never been hard to blame Richard Nixon for stuff. Communist witch hunts? Nixon. Illegal war in Cambodia? Nixon. Massive corruption and the decades of political cynicism that followed? Nixon and Nixon. That's a little glib, of course. Bad wars, crooked pols and red-baiting were all around before the 37th president. And give the man his props too  for the Clean Air Act, the Clean Water Act, the EPA, the opening to China, all of which were genuine Nixonian gems. Then there was the space shuttle, which bears Nixon's stamp as indelibly as all the rest. It was on Jan. 5, 1972, that Nixon brought the shuttle program into being with a presidential order and an appearance alongside NASA administrator James Fletcher. And this Friday, the 135th and last shuttle mission is scheduled to be launched, ending a program in which five ships carried 777 passengers into space, traveling a collective half a billion miles  or out past the orbit of Jupiter. These shuttles built the International Space Station, carried the Magellan, Ulysses and Galileo probes aloft and sent them on their ways to Venus, the sun and Jupiter respectively. They lofted the Hubble Space telescope too  easily the most productive scientific instrument ever built  and made occasional servicing runs to it, with astronauts conducting surgically precise repair work on the $1.5 billion instrument in the impossibly challenging environment of space. But there's the other side of the shuttle too. The $500 million price tag every time one took off, the months of maintenance and prep work needed between flights, the temperamental electronic and hydraulic systems that scrubbed launches time and time again, the thermal tiles the ships would shed like dry leaves. And, finally, there are the 14 astronauts who lost their lives when first Challenger and later Columbia soared aloft but never returned home. It's easy both to hate and love a ship like that. Conservative pundit Charles Krauthammer, who yields to no man when it comes to finely crafted crankiness, distilled that kind of cognitive dissonance splendidly once when he wrote that the space shuttle belongs in "the Museum of Things Too Beautiful and Complicated to Survive." The fact is, the shuttles almost didn't exist at all. A reusable, low-orbit space truck was hardly the initial direction NASA was planning to go in the triumphant afterglow of the Apollo program. It wasn't even the initial direction the Nixon administration advocated. 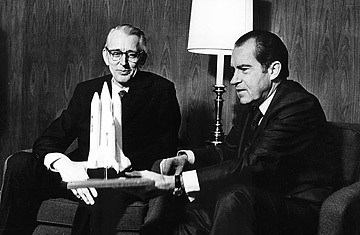 Not long after taking office, Nixon appointed a space task force to determine the future of cosmic exploration, chaired by Vice President Spiro Agnew. The group came back with an ambitious long-term plan that included the establishment of a near-Earth space station, further explorations of the lunar surface and a manned landing on Mars by 1986. "If there is any doubt that a manned landing on Mars has become the next grand objective of the U.S. space program, a reading of the Space Task Group report should dispel it," wrote one commentator in the January 1970 issue of the Bulletin of the Atomic Scientists. "The report ... not only designates Mars as the next port of call for astronauts, but also shapes most of the total space program in the next 16 years." But Nixon wanted none of it  nor of much of the remainder of the existing lunar program either, which was supposed to continue through Apollo 20 but was canceled before its final three missions could be flown. There has always been speculation in space circles that Nixon's antipathy for the lunar program was based on the fact that it was an idea initiated by President John F. Kennedy  whom Nixon never quite quit resenting. Maybe that's true; the man who gave us a White House enemies list was clearly not above pettiness. But it's also true that it was Nixon who was in office when Apollo 11 landed, and thus Nixon who got to perform the presidential touchdown dance  phoning the astronauts on the lunar surface, appearing on the deck of the aircraft carrier Hornet to welcome them home. Apollo had effectively become Nixon's program and any future Mars initiative would have been his baby as surely as the early space push was Kennedy's. The more prosaic explanation for Nixon's wariness was money. The Vietnam War was still consuming an outsize portion of the federal budget and inflation was roaring  at 6% in 1970  prompting Nixon to take the now unthinkable measure of imposing wage and price controls in the summer of 1971. Throwing money at Mars at a time like that might simply not have seemed tenable. Instead, we'd go the practical route, and a space shuttle would provide the way. A reusable orbital vehicle, Nixon promised in his 1972 statement, "will revolutionize transportation into near space, by routinizing it. [The vehicle will] be recovered and used again and again  up to 100 times. The resulting economies may bring operating costs down to as low as one-tenth those of present launch vehicles. [The trip to and from space will be] safer and less demanding for the passengers, so that men and women with work to do in space can 'commute' aloft." So how'd all that work out? The answer to that question, which was impossible to know at the time, was probably already baked into the overall plan  and the recipe was never very good. The grand  and so far unattained  dream of all orbital engineers is to design a craft that can take off either from a rolling start like an airplane or an upright posture like a rocket, fly to orbit and come back down without shedding any hardware along the way. See NASA's 3-D photos of the sun. See why space exploration is grueling work.